Service is a precious gift we give to God. Our time and our talents are gifts from God and it is our pleasure to freely give them to God’s work. Glen Reformed Church is governed by a Consistory including a Board of Elders and a Board of Deacons, called disciples of Jesus Christ, ordained and installed to service. Committees are comprised of people who use their time, talents and treasure to glorify God. The Consistory of Glen Reformed Church strongly encourages followers of Christ to faithfully listen to and respond to God’s call to experience the joy of serving Him. Presently the congregation at Glen Church is served by Pastor Thomas J. Flander, Jr, commissioned preaching elder. Guest pastors and accomplished preaching elders currently lead worship on the fifth Sunday when it occurs. The Board of Elders serve the congregation’s spiritual needs in accordance with the Reformed Church Book of Church Order. 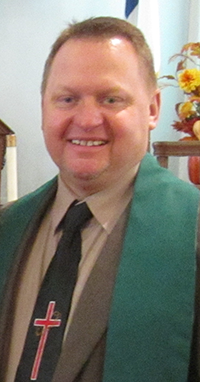 Also serving our congregation as a preaching elder commissioned to Glen Reformed Church by the Schoharie Classis is Thomas J. Flander, Jr. The Board of Deacons care for the congregation’s finances and physical needs of members and the community in accordance with the Reformed Church Book of Church Order.